Here are our top 25 most popular recipes for The Southern Lady Cooks. We have over 1000 recipes on this site and these are the ones that you love the most! A little bit of everything made this list. Easy Christmas Divinity–with over millions of views and hundreds of comments, this recipe is at the very top! Crock Pot Chicken and Noodles-this recipe has all the elements to make it popular. It only has 4 ingredients, cooks in a slow cooker and taste great! Southern Jam Cake-this cake is all class and all southern. Enough said! Macaroni and Tomatoes-a country dish that is always a hit! 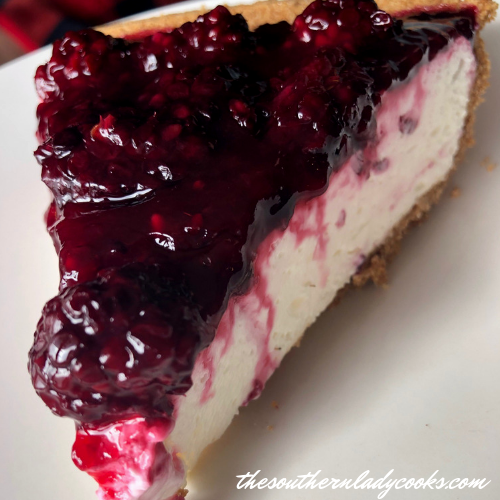 Fresh Blueberry Cheesecake with Homemade Crust-a wonderful dessert! Crock Pot Sausage, Sauerkraut, and Potatoes-comfort food at its finest! Amish Pasta Salad-everyone loves this recipe! Stuffed Green Peppers-a family favorite that we enjoy time and time again. Old Fashioned Banana Pudding-over a hundred comments on the site about this recipe. People love it. Easy Sour Cream Coconut Cake-this cake is always a good idea and a huge favorite on our site. Mississippi Mud Cake-an old recipe that is so good. 7 Up Cake-not only is this cake delicious, it’s gorgeous too! It makes the perfect addition to any dessert table. Hamburger Supreme Casserole-quick and easy and comfort food at its best. Salmon Patties-I couldn’t imagine my childhood without salmon patties. This recipe is always a good idea. Southern Cornmeal Hoecakes-doesn’t get much more southern than this recipe. Southern Coca Cola Cake-a southern tradition and a chocoholic’s dream. Mama’s Cathead Biscuits-our favorite biscuits! Best Banana Bread Ever-the name of this recipe explains it perfectly. Hamburger Creamed Gravy or SOS–a lot of people grew up eating this over toast for breakfast. Chicken Tortilla Chip Casserole-great recipe for those busy nights. Best Ham Salad Ever-it really is the best! Sourdough Bread and Starter-people love sourdough bread and this entry tells you how to make it along with making the Starter. Onion Patties-you can serve these with ketchup, salsa, ranch dressing or just eat them plain. We can’t eat these fast enough in our house. Baked Sweet Potato Casserole-this dish is perfect for the holidays but honestly, we love it anytime. Crock Pot Coca Cola Chops-these chops come out so tender. I hope you’ve found some recipes you can’t wait to try. Remember, that these are just our 25 most popular recipes out of 1000’s. We encourage you to stick around, look around and contact us if you have any questions. You can read more about our story here.